By far, the most important aspect of any home is safety. You and your family deserve to be safe and secure in your residence. For this reason, it is important for all property owners to consider the risk of lead based paint. Lead paint poses a significant risk to anyone in your property, especially young children. If you are concerned about lead based paint, the first thing that you should do is contact a professionally licensed and certified painter for removal services. At Annapolis Painting Services, our residential painting contractors specialize in lead paint removal services in Annapolis. With our assistance, you will be able to completely eliminate this problem from your home. 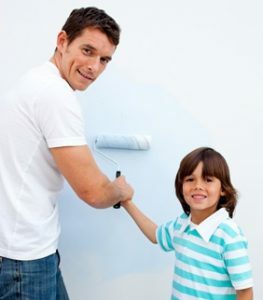 In order to help our customers better understand the risk of lead paint, our expert house painters in Annapolis have provided the following guide. Call us today if you have any questions about lead based paint, your property, or our exceptional skills and services. Our polite and professional staff would be happy to assist you in any way that we can with interior painting and lead paint removal. When Are You Most At Risk from Lead Paint? According to the Environmental Protection Agency, over 40% of the homes in this country are at risk for having lead based paint. The use of lead paint was only outlawed for residential purposes in 1978. As such, if your home was built before this time, it is highly likely that you have lead paint in your property. Lead paint becomes very problematic whenever you are disturbing it. As such, whenever you are conducting renovations on a portion of your home that was painted prior to 1978, you should contact a professional who is adept at lead paint removal for help. In this way, you can ensure that your renovations are conducted in the safest manner possible. By far, the most important thing to do when it comes to lead paint removal is to hire an EPA certified professional. As stated earlier, you and your family are at the greatest risk of lead exposure when the paint is being disturbed in any way. Therefore, it goes without saying that removing lead paint in an uncontrolled and improper manner can cause more harm than good. When you hire our Annapolis painting contractors for your lead paint removal project, you can rest assured knowing that you chose the best team for the job. We are professionally trained, immensely experienced, and EPA certified for lead paint removal. After our efforts, you and your family will enjoy an added sense of security in your home. If you are worried about lead paint, call our painters today at 410-974-6768, or fill out our online request form to schedule an inspection and lead paint removal services in Annapolis.